Not to get too personal, but do you have any junk in your trunk? Brad Steiner, an on-air personality at WDOD-FM 96.5, keeps several things in the hatchback of his Volkswagen, things he describes as essentials. He has a variety of craft beers, a roll of toilet paper, a towel and a box filled with scraps of paper containing ideas for his radio shows. He also has a pumpkin which his wife asked for back in November but which never got delivered and a bottle of Justin Blabaer beer. But does he have the necessary tools or the knowledge to change a tire should he have a flat? "No. That's why I have a cellphone," he says. Kerri Elkins' trunk, on the other hand, is loaded up with equipment for almost any emergency. "I just came from the grocery, so I have groceries," she says. "I've got two pairs of gloves, a jacket, two pairs of shoes, ear muffs, jumper cables, and I check the [spare] tire regularly. Oh, and I've got those things [hazard triangles] you put out on the road." Steiner and Elkins are representative, though somewhat reversed, of findings in a recent State Farm and KRC Research survey that looked at how prepared motorists are for roadside emergencies. The survey found, for example, that men are generally more prepared than women for an emergency. The survey, which sampled 1,010 adults over 18 years of age, also found that 67 percent of drivers had some sort of "junk" in their trunk. These items included food, toys, even a gorilla costume. 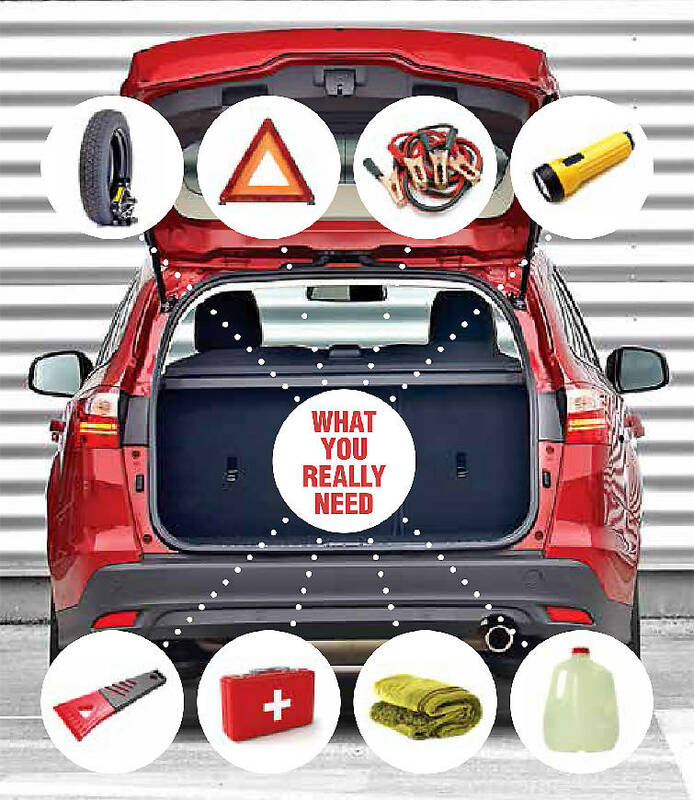 It also found that while 99 percent of drivers had at least one emergency supply in their vehicle, such as a spare tire or jumper cables, only 9 percent of respondents packed all the essential emergency roadside supplies, including jumper cables, spare tire, hazard triangle/road flares, flashlight, windshield scraper, first aid kit, water and a blanket. "Even on a relatively short trip, you can find yourself stranded for several hours," said State Farm safety representative Robert Medved in a news release about the survey. "From icy waters splashing up on Lake Shore Drive in Chicago to fog covering the Golden Gate Bridge in San Francisco, it's important to be prepared." In the survey, men were more likely to have at least one of the essential supplies in their trunk. It found that 64 percent of men had jumper cables compared to 53 percent of women. Sixty-two percent of men packed a flashlight versus 48 percent of women, and 47 percent of men kept a first-aid kit in their cars compared to 40 percent of women. Several folks in Chattanooga declined when asked if they'd open their trunks for a look-see. Some said the sight would be too embarrassing for them. Alex Williams, an intern at Hits 96.5, was OK with an examination. He carries several blankets in his Jeep -- and also has a clean shirt, a pizza delivery bag from a previous job, a lug-nut wrench and a set of screwdrivers. "My father always reminded me to have screwdrivers," he says. "'A knife is not a screwdriver,' he said." The State Farm survey also found that sedan drivers (63 percent) are less likely to carry emergency supplies compared to SUV (75 percent) and truck owners (73 percent). And it found that only two in five drivers check their vehicle emergency supplies at least twice a year to make sure they are working. Such checks should make sure spare tires are properly inflated, first-aid supplies are current, all other supplies are fully stocked, and the cellphone charger is compatible with either a power outlet or an USB port in your car, according to the release.